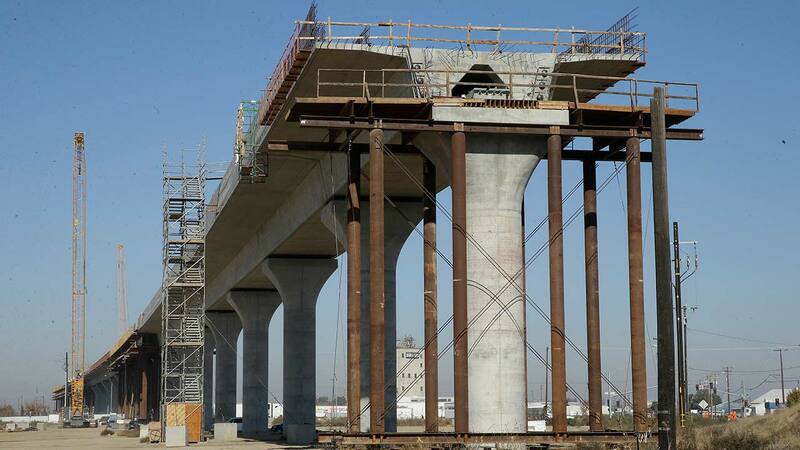 SACRAMENTO, Calif. -- Lawmakers approved an official audit of California's high-speed rail project Tuesday with the goal of understanding whether the ambitious infrastructure plan can be completed on time and without more dramatic cost increases. "What we are all trying to do is to get past all of the noise, to get past all of the politics, to get down into a thorough audit that is going to give us a very good heads up as to what is coming and what has happened," said Republican Assemblyman Jim Patterson of Fresno. Patterson requested the audit alongside Democratic Sen. Jim Beall of San Jose. The bullet train is projected to first connect the Central Valley to Silicon Valley before eventually going down to Los Angeles. It's been plagued by delays and cost overruns, with the California High-Speed Rail Authority recently announcing a $3 billion jump in costs in the Central Valley alone. State auditor Elaine Howle said her evaluation would take six to nine months. Republicans on the committee offered a more critical take of the project and whether it can realistically be up and running without needing state subsidies to operate. As Democrats backed the audit, they highlighted the project's benefits including the roughly 1,500 construction jobs it's created in the Central Valley. "I look forward to the rest of the state realizing the benefits that are happening in my community," said Democratic Assemblyman Joaquin Arambula, who represents part of Fresno. Dan Richard, chairman of the California High-Speed Rail Authority's board of directors, said he welcomes the transparency the audit will bring and that the authority will implement its recommendations. "It's critical that the public maintain their confidence in our ability to do this," he said. "I think the public confidence will be sustained if they know, well, you've done some things well, but these things need to be improved and you're doing that." Voters approved $10 billion in bonds to help finance a train that can take people from Los Angeles to San Francisco in less than three hours in 2008. Then, the project was estimated to cost about $40 billion. Now, the costs are upward of $65 billion. The timeline of the project has changed too, with the authority switching and building north first instead of south in 2016. A new business plan is due to lawmakers this spring. It is likely to offer updated costs and a new timeline, as well as an evaluation of whether the operating costs of the train can be paid for without state subsidies. The lawmakers' audit request comes as the authority brings on a new chief executive officer, Brian Kelly, most recently the head of California's state transportation agency. The lawmakers said an audit would help ensure "effective management" of the project. Beyond looking at the cost and the timeline, Howle, the auditor, will evaluate the economic benefits of the project to communities where it is being built and whether the train will meet its sustainability goals to help reduce greenhouse gas emissions. The auditing team will also examine the authority's process for approving changes to contracts. The board has updated contracts on numerous occasions, often adding more money due to delays from lawsuits or trouble gaining rights of way or environmental approvals. Some Republican lawmakers said they wanted to see the audit's scope go even further. "Every red flag that you could raise about a public works project is raised with high-speed rail," said Republican Assemblywoman Catharine Baker of Dublin. Democratic Gov. Jerry Brown has defended the project in his State of the State address.